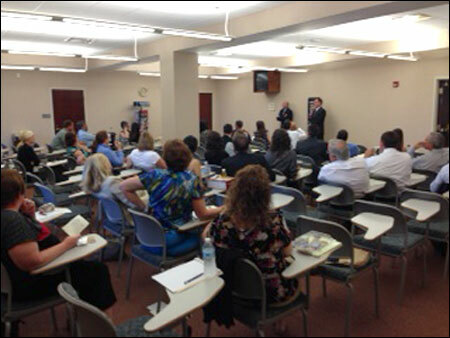 Paul Rice, pictured at left next to Circuit Judge Matthew Foxman, conducted a meeting of the Volusia County Bar Association’s Family Law Section at the Volusia County Courthouse in Deland, Florida on June 5, 2014. The family law section has traditionally met at the Courthouse Annex in Daytona Beach, but family law judges, Matthew Foxman and Dawn Nichols, requested a meeting at their courthouse in Deland in order to get more west side Volusia lawyers involved. Because of the support of Judges Foxman and Nichols, close to forty family law attorneys participated in the meeting. Judge Shawn Briese, one of two family law judges based in Daytona Beach, took time out of his busy schedule to attend the meeting in Deland. These meetings provide the judges and family law practitioners a forum in which to speak openly and candidly to each other about how to improve the family law litigation process. The judges’ judicial assistants also attended to instruct the lawyers as to each particular judge’s preferred procedures. Bob Sterner, director of the Seventh Judicial Circuit’s Family Court Services, was also on hand to field questions about the administration of justice in the courthouses in Volusia, Flagler, St. Johns and Putnam Counties. Paul Rice is the chair of the Family Law Section and is board certified in divorce and family law by the Florida Bar. Rice is a senior partner in the Rice & Rose Law Firm and has practiced in east central Florida for over 30 years. The main office of the Rice & Rose Law Firm is at 222 Seabreeze Blvd., Daytona Beach, Florida. Mr. Rice can be reached at 386-257-1222 or paulrice@riceroselaw.com.